Another month, another Birchbox. Birchbox is a monthly beauty box subscription with 5-6 products tailored to you for £12.99 (+P&P) a month with new products and new brands. It's always exciting to receive parcels especially when it's a box of beauty goods. This month's Birchbox is called 'Never Ending Summer'. This month's Birchbox is a collaboration with Millie Mackintosh who I only know from watching Made in Chelsea - she has absolutely flawless skin! Anyways, starting with the packaging which she 'designed' reminds me the prints on Ted Baker - the florals and pastels shades. It's very pretty and girly and I use the boxes as spare storage within my make-up draws. Moving on to the actual product. We had the chance to choose which full-size product we wanted. I opted for 'John Freida 7 Day In-Shower Treatment' which is supposed to give us to 'oomph' that will last for days. I also received a small cute size of the Nails Inc Nail Polish in Eaton Avenue - it's a beautiful blue-purple pastel shade which I am wearing now. And lastly a very exciting sample of the Elemis Hydra-Nourish Night Cream - which says to be packed with hyaluronic acid to give your skin that extra boost if moisture. I'm looking to change my night cream so this has came in handy. 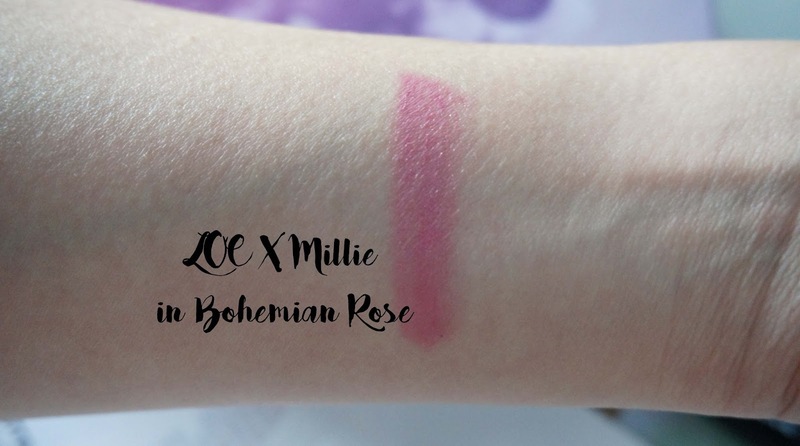 Lastly, I received the Loc X Millie collab product 'Ultra-Gloss Lip Pencil in Bohemium Rose'. Which contains hydrating abilities that keeps your lips soft and has an ultra glossy formula. It is supposed to be long lasting but there are mixed reviews on the Birchbox site. The shade is a pretty rose pink which I don't think suits me but when I tried to remove this it left a stain, so it does wear off nicely. The last product is the Indeed Labs Hydraluron Moisture Boosting Mask - I am crazy about sheet masks and I can't wait to use this on my skin to give my skin more moisture - it contains hyaluronic acid so I have high expectations. That is all for my Birchbox this month, the most favourite picks from them all are the; Indeed Labs Hydraluron Moisture Boosting Mask, Nails Inc Nail Polish in Eaton Avenue and Elemis Hydra-Nourish Night Cream. What are you favourites this month?